What are Lifesize Legends made of? 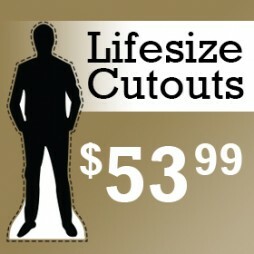 We make Lifesize Legends with corrogated cardboard and high quality vinyl. All checks are to be made payable to AutoGraphiX. Checks should be mailed to 81 Waller Street, Wilkes Barre, PA 18702. Production of your order will not begin until your check has cleared and we have received artwork. I need my Lifesize Legend ASAP, can you hurry what is production time? For faster production, we offer several rush production options. Rush orders placed before Noon est are considered received that day. After noon, they are processed the following business day. 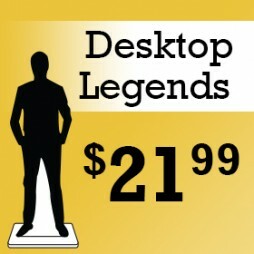 We can' ship any rushed Lifesize Legends with ground shipping. What Does Rushed Production Do? Rush Production is producing the order ahead of other standard production orders. All rush orders must be placed by Noon est. Currently we offer 3 rush production times. Rush production is separate from shipping. Please keep this in mind when ordering time sensitive items. We are not responsible for delays to the production or your item(s) due to: mechanical failure, raw material shortage, or delays caused by shipping. We do not guarantee any production time unless the customer has purchased the rush production option. The ground shipping method is not a guaranteed shipping method offered by UPS. This means UPS may estimate shipping to take 2 days from NYC to Washington D.C. If it takes 2 weeks to get there, it is still considered a successful ground shipment. Next day air, 2 day, and 3 day select are the only domestic shipping options guaranteed by UPS. With this guarantee, only the shipping costs are refundable in the event of a delay, not the value of the time sensitive item. With this explained, please plan your order accordingly. How is a Lifesize Legend shipped? Standees are delivered scored and folded in one flat package, unless multiple items are ordered. They are packaged and shipped in a cardboard container with plastic reinforced edge protectors. All shipping prices shown are directly from UPS. Any item exceeding 165 inches in girth may be shipped via common carrier and charged at least $125 for shipping. Can you use my shipping account with...? Sure, but if it is not through UPS or UPS Freight, there may be a pick up charge. Why is there a charge from Wet Paint T-Shirts on my card? All charges to credit cards will show up as Wet Paint T-Shirts Inc. and will be processed online through Pay pal or by phone. There will be a $25 service charge for any disputed charges, this is your warning. I didn't get my cutout on time. What do i do? I don't see the Lifesize Legend I'm looking for. No problem! 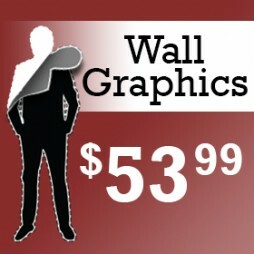 We can make a custom cardboard cutout or wall graphic of just about any* historical figure! Just send us a photo and some information, such as the height or approximate height so we can create an accurate Lifesize Legend for you!